This may be a wonderful alternative to my Concert Chatter, for which I have written nothing in several years. Concert Chatter took quite a bit of time to conceive, write, edit, and have it come out reading as though some thought went into it. With all of the touring the Kingston Trio has been doing for the past three years, I simply didn't devote any time to writing, and for that I have felt some guilt...........okay, not that much, but some. This blog won't really take the place of a long, thematic piece like Concert Chatter, but it will allow me to spit out some short pieces and perhaps attach some interesting pictures. 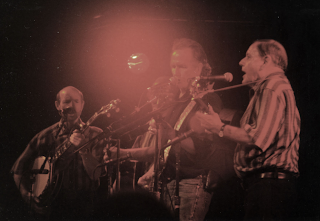 I thought that since this blog site shows in its initial offering a memorial picture to our recently deceased friend John Stewart, I would attach an odd little picture that was sent to me quite some time ago, from back in the days of the Bob/Nick/George configuration of the Kingston Trio. You must look twice to recognize that there are four of us here. It's just that Bob is obscured by his own halo !!! There will be more blogs here, especially if you guys seem to enjoy it.......or if I find it to be an easy place to gripe, complain, piss & moan.